Feature 24 gauge Type 316 Stainless Steel Construction and are ideal when high solvent purity is essential. 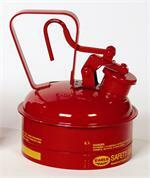 They are FM approved and meet OSHA and NFPA requirements. Metal - Blue (Kerosene) 1 Gal. Metal - Blue (Kerosene) 1 Qt. Metal - Blue (Kerosene) 2 Gal. Metal - Blue (Kerosene) 2 Qt. 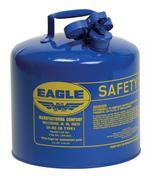 Metal - Blue (Kerosene) 5 Gal. Metal - Blue w/F-15 Funnel 1 Gal. Metal - Blue w/F-15 Funnel 2 Gal. Metal - Blue w/F-15 Funnel 5 Gal. 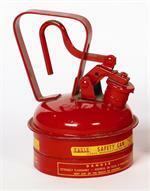 Metal - Green (Oils or Combustibles) 1 Gal. Metal - Green (Oils or Combustibles) 2 Gal. 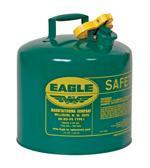 Metal - Green (Oils or Combustibles) 5 Gal. Metal - Red 1 Gal. Metal - Red 1 Qt. Metal - Red 2 Gal. Metal - Red 2 Qt. Metal - Red 5 Gal. 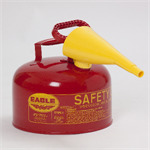 Metal - Red w/F-15 Funnel 1 Gal. Metal - Red w/F-15 Funnel 2 Gal.